The “hockey stick of human prosperity” is a metaphor commonly bounced around in political science. The pithy phrase attempts to summarize the global economic history of the past thousand years. 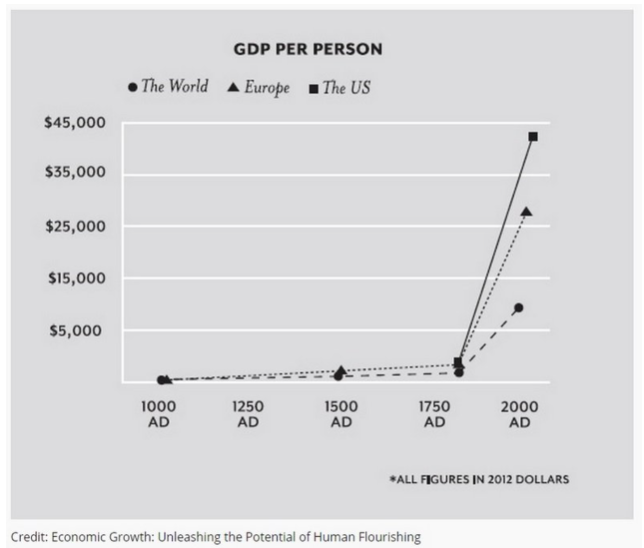 Broadly speaking, the world was desperately poor for many centuries, and then, all of a sudden, growth took off. Accordingly, a graph of gross domestic product per capita around the world over the last thousand years roughly resembles a hockey stick. Centuries of slow growth form the horizontal handle; the economic explosion of the last 200 years forms the blade. The metaphor has become ubiquitous. Prominent economist Don Boudreaux starred in a 2014 YouTube video explaining the concept. Well-known psychologist Jonathan Haidt called the hockey stick “the most important graph in the world.” The website core-econ.org, an “open-access platform for anyone who wants to understand the economics of innovation,” features multiple lessons about history’s hockey stick. Despite its popularity, the hockey stick metaphor should be retired from academic discourse. Understanding these graphs as hockey sticks fundamentally misrepresents the story the graphs tell. These graphs should be seen as divergences. A closer look at the data shows some regions growing with tremendous speed while others grow only modestly. They show the nations of the world being sorted into first world, second world, and third world. In 1800, gross domestic product per capita (GDPPC) in Europe was roughly three times higher than GDPPC in Africa. In 2000, GDPPC in Europe was roughly ten times higher than GDPPC in Africa. It is easy to make a critical mistake when examining these statistics — to swoon at the rising prosperity and ignore the rising inequality. The point is a semantic one, but semantics matter. Over-reliance on the hockey stick metaphor has lead scholars awry. Famous political scientist Deirdre McCloskey has spent her career attempting to solve the questions raised by the graphs above. In her book Bourgeois Dignity, she grapples specifically with the dilemma of how the West became the West — that is to say, how the richest nations in the world got rich. Along the way, she discounts the legacy of colonialism as a foundational factor in the West’s miraculous relative growth. McCloskey argues that empires rarely produced gains for the common citizen, instead benefiting only “the rich and powerful and rare.” She notes that white South Africans’ real incomes grew a modest 2 percent during the 1917-1994 Apartheid era. She writes that Spain and Portugal remained some of the poorest countries in Europe despite holding some of the world’s largest empires. For McCloskey, colonialism cannot explain the above graph, because colonialism did not enrich all of the colonizers. But suggest to a person from Latin America or Africa or India that colonialism did not affect the formulation of the modern global economic order — they’ll look at you like you have three heads. Remember even the most rudimentary international outcomes of colonialism: Violent destruction of flourishing native civilizations in Mexico. Perpetuation of the transatlantic slave trade. Belgian atrocities in the Congo. Colonialism might not have made rich countries rich, but it did keep poor countries poor. McCloskey fails to realize that colonialism is a negative-sum game, yielding small benefits for colonizers and tremendous losses for the colonized. She’d say that rising prosperity is a positive, no matter the other circumstances, and that after all, quality of life was higher in India post-colonization than it was before. Imagine, though, if cross-cultural exchange between Britain and India had been cooperative instead of exploitative. At best, colonialism minimizes the benefits of cultural exchange. The worst case scenario is outright genocide. McCloskey’s error is the hockey stick effect in action. She is able to dismiss colonialism because she starts with the wrong question. Perhaps colonialism did not enrich the West directly, but it certainly played a role in the divergence between economies in the West and in the Gglobal South. McCloskey is so focused on the top line of the graph that she ignores all the others. She begins with a hockey stick, and the result is the inaccurate assertion that colonialism was not that important after all. McCloskey is not the only one to have misinterpreted the above graphs. Many have used the graphs as evidence for the virtue and value of neoliberal capitalism. James Pethokoukis, writing for the American Enterprise Institute (AEI), calls the hockey stick “perhaps the most powerful defense of market capitalism you will ever read.” Writer Jonah Goldberg goes a step further, implying causation. The National Review Institute quotes him as saying, “The real ‘hockey stick’ was capitalism.” The dramatic growth that formed the blade of the hockey stick was caused by the Industrial Revolution, which developed hand in hand with modern free-market capitalism, or so the story goes. This interpretation of the hockey stick suggests that free-market capitalism is an engine of fantastical growth. But the recent empirical record casts serious doubts on the free market’s ability to pull struggling economies into the promised land. For decades, the International Monetary Fund and the World Bank, along with Thatcher and Reagan-era Western governments, have advocated free-market economic reforms as a path towards growth. The results have been decidedly mixed. No region tried harder than Latin America to deregulate in the the 1980s. From 1960 to 1980 –– the pre-neoliberal era –– GDP per capita in Latin American countries grew at 2.8 percent per year. From 1980 to 1998, that GDP per capita growth completely stagnated, settling in at 0.3 percent per year. In Africa, meanwhile, from 1960 to 1980, per capita GDP grew 1.6 percent per year, but the adoption of neoliberal policies in the 80s saw that number drop to -0.8. Free-market capitalism may have caused the inequality on display, and it has shown no indication that it can close the gap. Understanding the graph as a hockey stick rather than as a divergence can lead to misrepresenting the role that free markets have played in the past and should play in the future. If, indeed, neoliberal capitalism did shape the graph above, then it is wrong to conclude that neoliberalism is a driving force for prosperity without understanding that it is simultaneously a force for inequality. The hockey stick metaphor results in an unrealistic idealization of the West. It allows McCloskey to flippantly discard the excruciating, violent legacy of western colonialism. It allows Pethokoukis and Goldberg to suggest that western neoliberal capitalism is the answer to all of the world’s problems. The analogy seems harmless, but its ideological ramifications are significant. Political scientists have spent decades arguing about the real causes of this rapid economic growth and divergence. There is no single answer, no smoking gun. But it will be impossible to arrive at the best answer without clearly understanding the question. It is wrong to simply ask why the West became so fabulously wealthy. Instead, ask: Why did the fortune of the West diverge so dramatically from the fortune of the rest of the world? The conversation must not start with patriotism but rather with global-minded empathy. Only then can the real work begin. Chang, Ha-Joon. Kicking Away the Ladder: Development Strategy in Historical Perspective. Anthem Press, 2002.